I have been really feeling the whole boho decor vibe lately. In fact, I have a 4 foot long branch hanging in my living room right now. Wrapped in string and with birds and stars dangling from it…I should probably blog about that?! 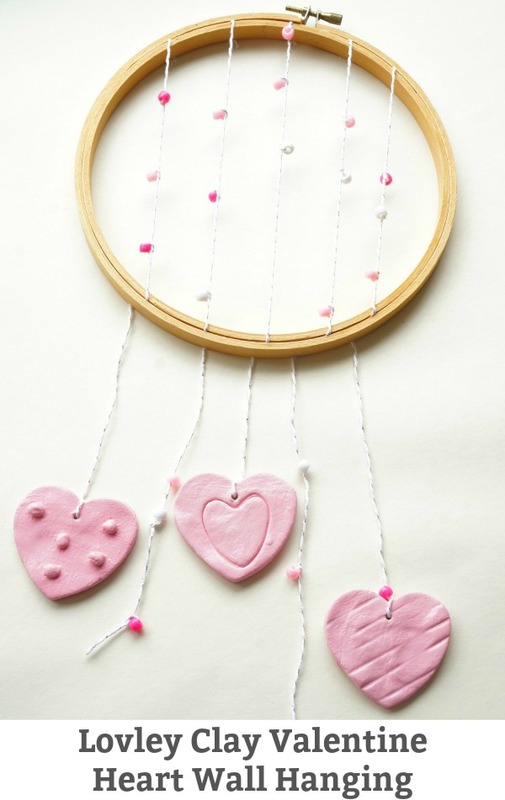 Anyhow, I’ve been wanting to make a piece of boho inspired wall art that incorporates an embroidery hoop and Valentine’s Day is the absolute perfect excuse for making something lovely and pretty. I wanted to make something special for my girls and Valentine’s Day presented me with all the inspiration I needed. With a little clay, an embroidery hoop and some string I was able to make a super cute piece of art to hang on the wall. Slice off a piece of the clay. I have always used DAS air drying clay, I love it. 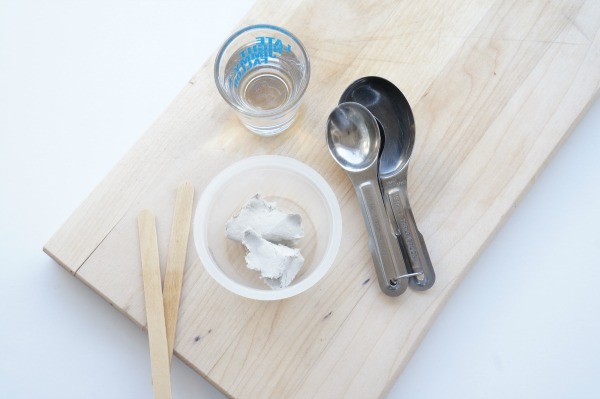 If you would like, you can make your own clay with this baking soda recipe. A good tip is to have a rag (or paper towels) and a dish of water ready. Slightly wet hands will make working with the clay a lot easier and the rag is for cleaning up. Place a piece of wax paper on your work surface. Okay, once you have your slice of clay it is time to start working the clay into a disc. Working with clay can be very meditative. 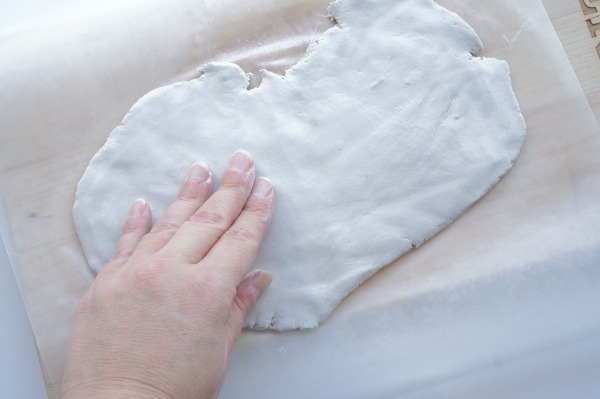 You can use a rolling pin if you like, but I like using only my hands to flatten the clay. I like the more handmade look this gives you. Press the clay into a flat 1/4 inch piece of clay, on the wax paper. 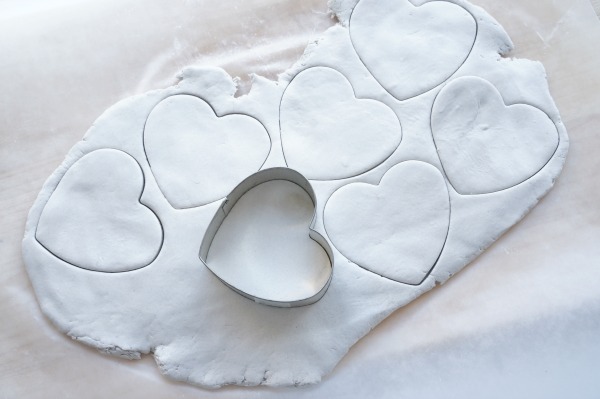 Now that the clay is flat use the heart shaped cookie cutter to cut out the shapes. We used 3 hearts for each wall hanging. 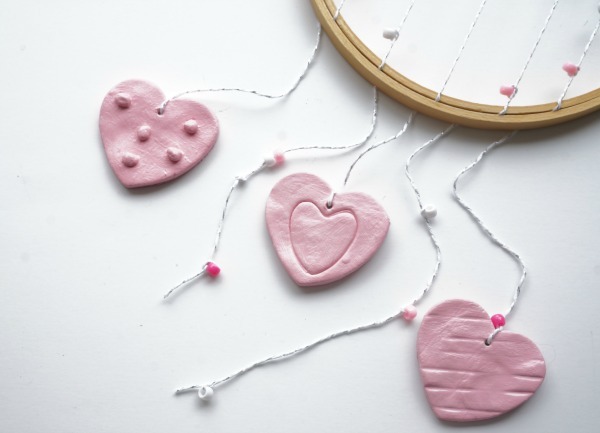 Set the hearts aside on a piece of wax paper. Wrap up the scrap clay, to use in a minute. Use the wooden skewer to make a hole in the heart, where the string will feed through. Set the hearts aside. 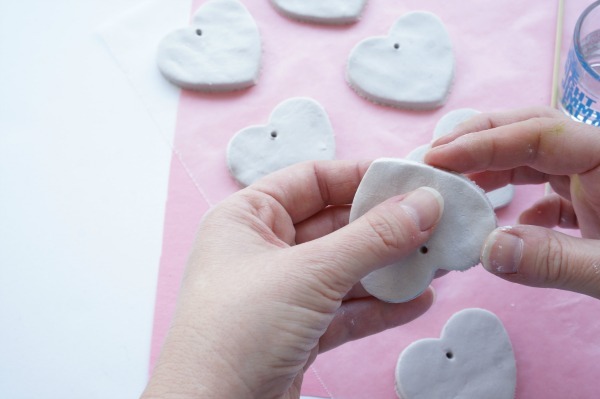 The hearts may have rough edges…wet your fingers and smooth out the edges. Your wet finger can smooth out any bump or cracks. For our hearts we tried three different techniques to decorate the hearts. For the first technique we wanted to apply 3D dots to the hearts. In order to adhere the dots we need to make a small dish of slip…clay glue. Slip is a “glue” made from clay and water. So, add a chunk of clay to a small dish and pour in a tsp of water. Use a craft stick to start breaking down the clay. 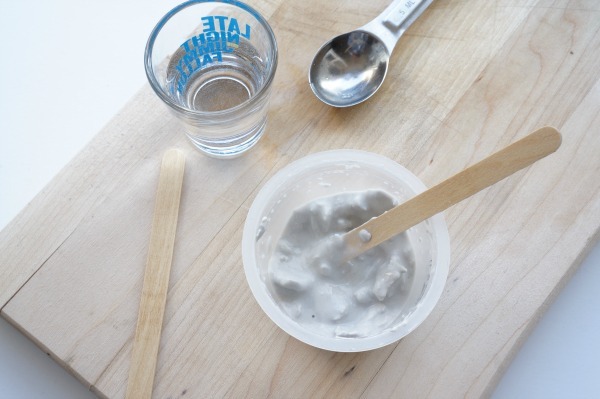 Keep adding water and stirring the clay until you make a glue-like paste. That’s slip…your homemade glue. 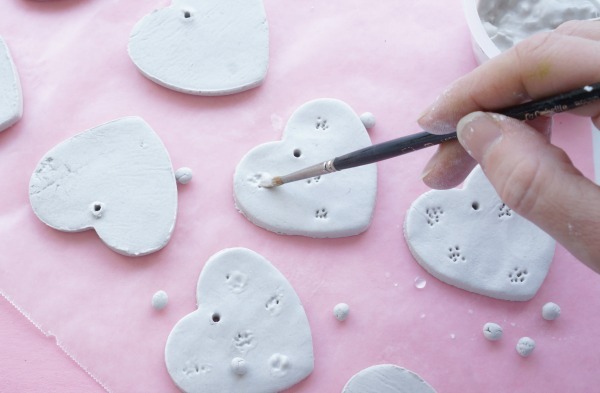 Make little balls of clay for the dots. 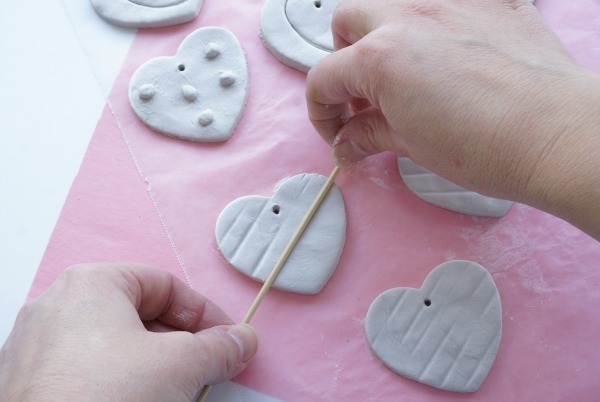 To adhere the dots to the heart, use the point of the skewer to make little shallow holes in the heart – wherever you want to put the dots – and on one side of the little clay balls. 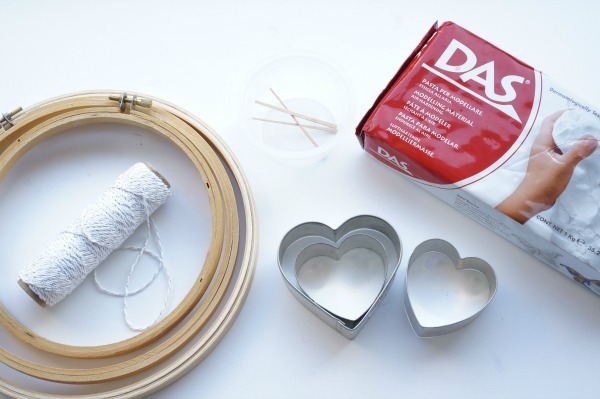 Use a paintbrush to paint the slip into the shallow holes on the heart and on the balls. Place the balls on the heart and press them in place. Use the paintbrush to paint more slip around the balls…the slip will fill the little gap between the ball and the heart. Set the heart aside to dry. The next technique we used was super simple. 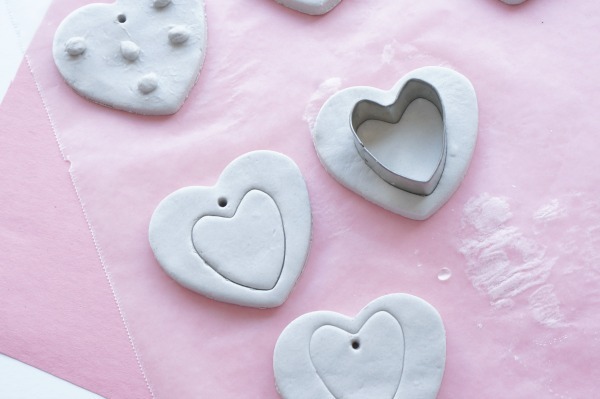 We pressed a smaller heart cookie cutter to make a heart impression in the heart. Finally, an even easier technique. We used the side of the wooden skewer to make lines in the hearts. 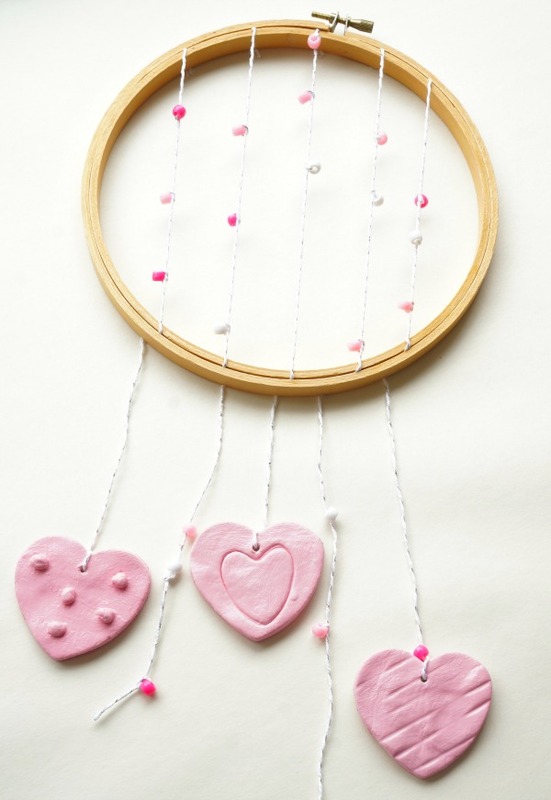 Set all the hearts aside to dry. 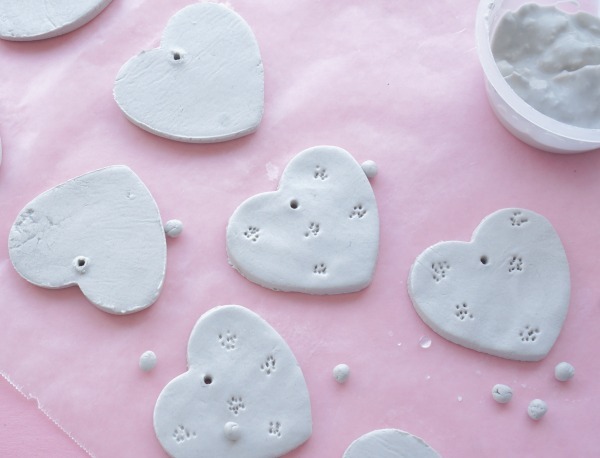 Once the clay has dried, it is time to paint the hearts. I was inspired by the colour of the sunrise on an early morning dog walk. I wasn’t sure if I wanted to paint the heart pink – then the sky was this beautiful shade of pink – so I went with it. 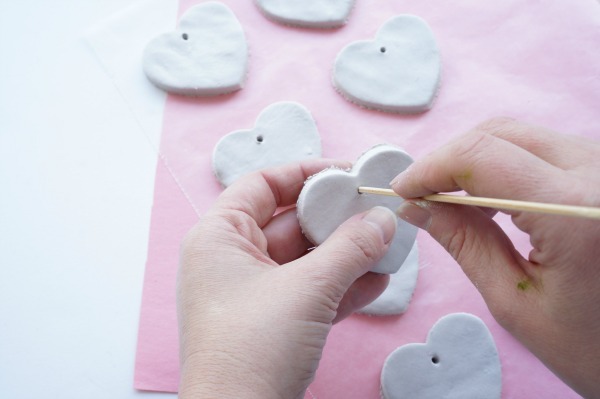 Let the hearts dry and paint on a clear coat of Modge Podge to seal the hearts and add a subtle gloss. Okay, now it’s time to work on the embroidery hoop. Our hoops are 4 inches in diameter. Cut 5 lengths of string, about 10 inches long. Feed and tie as many beads as you like onto the string. These beads will be positioned inside the hoop. Once the beads are in place, place the string in position and slide the outer hoop in place – tightening it in place. I used a little tape to hold the string in place while I tightened the hoop. 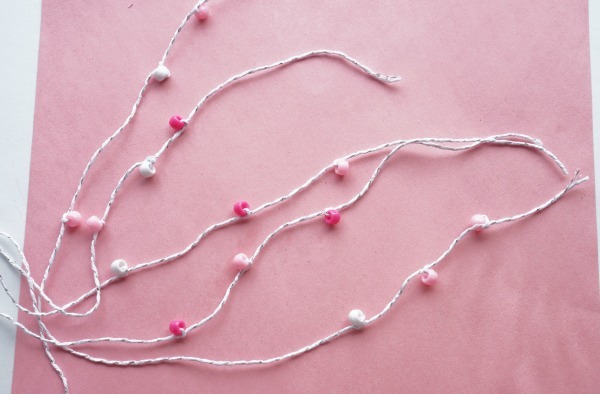 Feed more beads and the hearts onto the ends of the string. We tied 3 hearts onto 3 stings and added beads onto the other 2 strings. 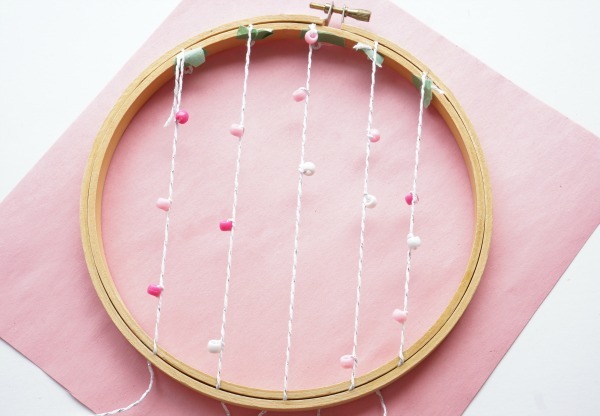 Loop a length of string onto the top of the embroidery hoop and hang up the wall hanging. We made 3 wall hangings – one for each of my daughter’s bedroom doors and one to hang in the living room. 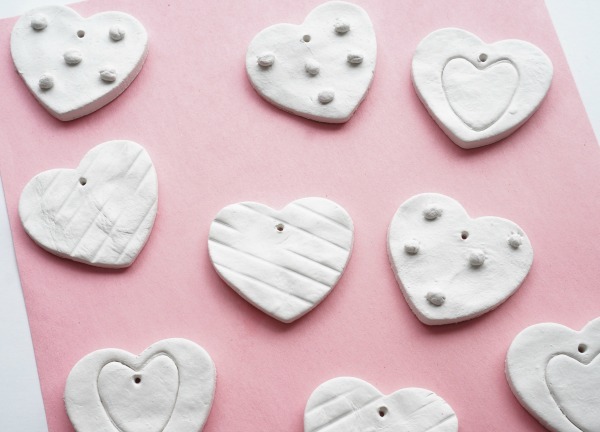 I love how our wall clay hearts turned out and so do my girls. We will definitely be hanging these for Valentine’s Day for years to come. Today’s post is part of the Valentine’s Blog Hop being hosted on A Pretty Life in the Suburbs. 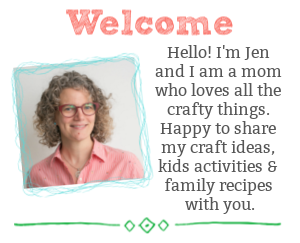 Please take the time to hop around and explore all of the absolutely beautiful recipes, art and craft projects being shared. Oh!!! 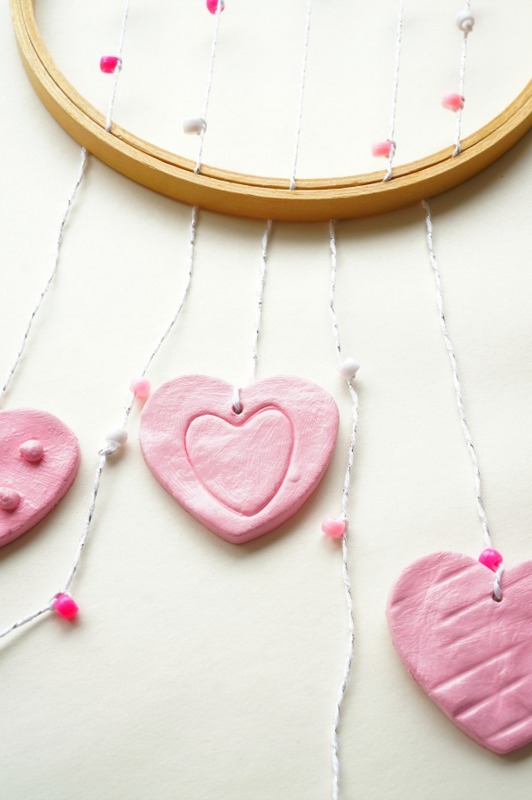 Such sweet Valentine decor!! And something that can be kept forever, I love it!! Pinned! Thanks. For sure, a lovely keepsake. These are so cute! 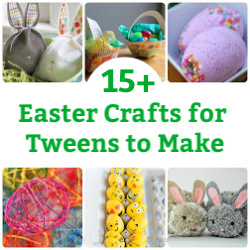 They’d make a great craft for kids to do, too! 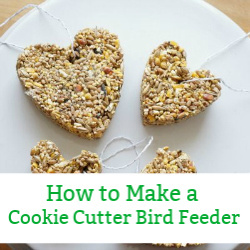 Perfect for kids to make. Thanks. Ohhh this is so lovely!!! And my daughter would be 100% loving doing this with me! Yes, I think we are going to do a smaller version at my daughter’s birthday party next weekend. This is such a pretty idea Jen! I love the boho vibe! What a sweet craft to do with the kids. Great tip on the ‘slip’! The dots add nice dimension to the hearts. Thanks. Yes, my kids love how they turned out. What a great idea! My kids would love making this. Jen! So glad to have found your blog via the Hop! I love your clay wall hanging. I totally have some air clay that I could use this weekend to make our own. I would have been so excited about this as a little girl! This is such a pretty idea! Loving the boho vibe too! This looks like fun to make and I think I would hang it on my daughter’s bedroom door! These are gorgeous! Would look great in my daughters play room!! This is such a cute idea for Valentine’s day! Jen, such a sweet Valentine’s Day project! Such a cute Valentine’s idea!